Neither of these two teams have won a game yet so both sides are coming into this game with a 0-2 record. This isn’t something that any team wants but there will be a chance to break that record while condemning a rival to a 0-3 record. Even at this early stage of the Euroleague season, that isn’t something that any team can be too happy with. The Israeli side have changed their coach with Rami Hadar taking over from Erez Edelshtein. 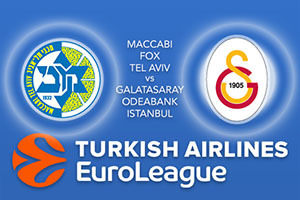 History is definitely on the side of Maccabi as they have picked up a 4-0 record against their Turkish opponents. These four games have come in the past three seasons, so it isn’t ancient history. The most recent game between the two teams saw Maccabi win by a score of 81-72 and Devin Smith managed to grab a total of 22 points in that game. While the start of this season has been troubling for Maccabi, they have Andrew Goudelock sitting with an average of 21,5 points per game. Sonny Weems has chipped in with an average of 15 points per game and Smith has an average of 12 points per game coming into this match. Galatasaray have played their opening two fixtures of the season at home and they have lost them both. This means they may actually appreciate playing away from home but they know that they are in for a tough time with this game. They’ll be looking for Austin Daye to score as he has an average of 18 points per game so far this season with Alex Tyus providing an average of 17 points per game this season. Sinan Guler has served up an average of 10 points per game this campaign. Galatasaray have given up an average of 97.0 points per game this season, something they’ll be desperate to change if they want to get back to winning ways. The hosts are backed to win this game and you can take Maccabi Fox Tel Aviv at -8.5 with odds of 1.90 for this game. You will also find that the Over/Under market is available for this game and you can go UNDER 168.5 at odds of 1.90. Bet Now!